Information about indigenous peoples living in the borderlands between the USA and Canada is surprisingly sparse. While there are several thematically or regionally focused publications, the only comprehensive survey of the northern indigenous borderlands covers a mere 40 pages in the publication Native Nations and U.S. Borders: Challenges to Indigenous Culture, Citizenship, and Security by Rachel Rose Starks, Jen McCormack, and Stephen Cornellis. So how can I make sure that this website truly represents and respects the world views, values, and concerns of the very people that I seek to empower? 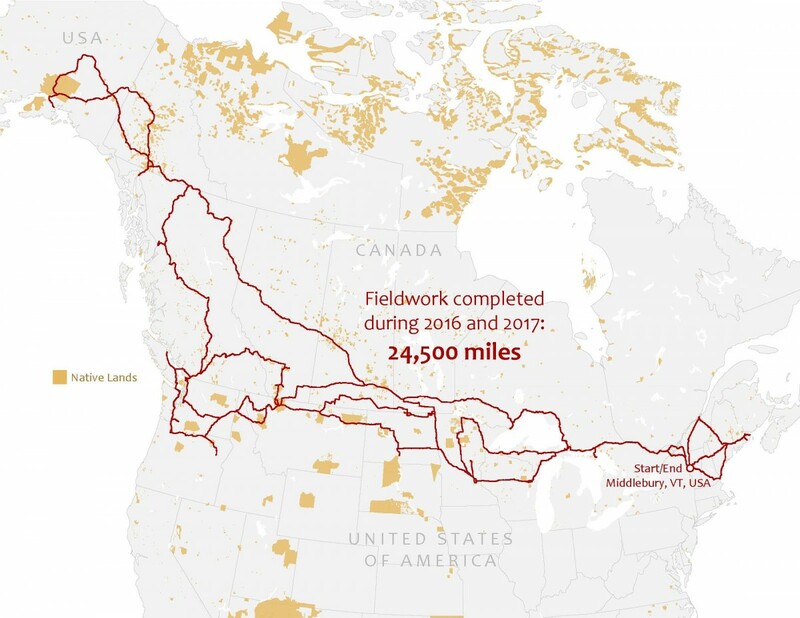 The answer lies in intensive fieldwork in native areas along the US-Canadian border to learn about different issues from the native peoples themselves. 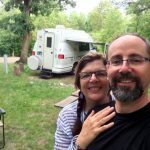 During the summer and fall of 2016 and 2017, my wife Patricia, who is an enrolled member of the Sault Ste Marie Tribe of Chippewa Indians, and I went on the road in an old camper van and ventured as far as Anchorage, Alaska and St. Andrews, New Brunswick to visit indigenous borderland communities. By the end of first part of the fieldwork in 2016, we had covered over 10,000 miles. In 2017 we traveled an additional 14,000 miles or the equivalent of driving from Berlin to Vladivostok, and back! 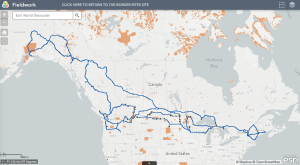 You can see the routes we took and some of the photos we took along the way on the map below. We were deeply honored to have the chance to meet with people from thirty different indigenous communities and institutions, to exchange ideas with scholars and artists, to attend Pow Wows and spiritual gatherings, to participate in the Haa Kusteeyi Celebration at the Teslin Tlingit Heritage Center in Yukon Territory, and to be on the shores of Vancouver Island to welcome the intertribal canoes as they reached their final stop at Campbell River First Nation in British Columbia. We learned so much from talking to people, traveling along endless roads through varied landscapes, and from simply experiencing places that are so different from our New England home. We recorded many interviews, took countless photographs and videos, collected tribal newspapers and documents, and Patricia wrote many poems; I now have a vast trove of stories and materials that I will continue to incorporate into the website. One of Patricia’s poems, The Borderline, encapsulates the experiences of indigenous peoples on the US-Canada border particularly well. You can find it on the ‘Art & Poetry’ page. We have sought to be inclusive and above all respectful in our attempts to learn about different dimensions of the borderland rights and rites of Native communities on either side of the international boundary line. Guided by minaadendamowin, which means ‘respect’ in the Anishinabe language, we will only include generally available information on the website. Any photos, videos, or audio recordings from interviews of individual persons will be presented to them for review and approval before it is made public on the website. The ‘contact’ page on the website also gives native communities and institutions the opportunity to make suggestions or ask for changes. Click on the map to the left to open an interactive version of the Fieldwork map in which you can zoom and click on items for more information. For additional navigation tips, see below. The top left-hand corner of the map shows several icons which can be used to navigate. The ‘plus’ and ‘minus’ buttons may be used to zoom in and out. The home button will return you to the map’s initial extent. The layer list button will open a menu that displays all the layers that are on the map; these may be turned off and on. Finally, the legend button displays a legend with symbols and labels that correspond to those on the map. We were also fortunate to exchange ideas with: noted Ojibwe scholar Anton Treuer at Bemidji State College; environmental borderlands scholar Emma Norman at Northwest Indian College; Science Director of the Yukon River Inter-Tribal Watershed Council, Edda Mutter; Teslin Tlingit film director Carol Geddes; Hoonah Tlingit artist Renee Culp; Yukon Tourism and Culture Minister Jeanie Dendys.